I can never get enough of circle lenses and I'm always happy to try and review different ones. The lenses I'm reviewing today is the GEO Grang Grang Circle Lens from LensVillage. I have been a big fan of GEO lenses and the Angel series is still my favorite lenses ever. LensVillage is a Malaysian based circle lens store that offers a wide variety of circle lens. All circle lens are authentic and has a money back guarantee. Even for international shipping they are pretty fast and they offer excellent customer service. 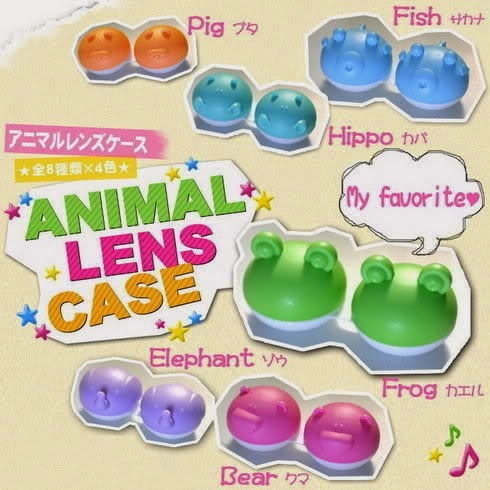 Each pair of regular priced circle lens that you order from Lensvillage comes with a cute animal case! It is available in different colors too! If you happen to buy on sale or promotional lenses, keep in mind that you may not receive an animal case. Each vial of GEO Medical lenses comes with an authentication code which you can check on their anti-fake system. The Grang Grang lenses come in 2 shades, Choco and Brown. What I have here is the Choco which is a deeper shade of brown while the Brown is lighter and has a golden tone to it. It also comes in two sizes, one has a diameter of 14.2mm and the other one is 15mm for a more dolly eyed look. This lens series is bigger than the usual circle lenses which comes in 14mm, which is considered as Natural Big Eye Lenses. Base curve for this particular lens is 8.6 with 38% water content. As you can see, the limbal ring or the outer ring is wider and darker which gives the dolly look. As you can see on the photos, this dark shade of brown looks very natural. If you have a different or lighter eye color than mine, you would most likely have a two-toned effect with this lenses. The design is also subtle and blends naturally. probably out of all the GEO lens series I have tried, the Grang Grang in Choco is the most natural.The other series have more prominent designs and lighter shades so it appears a little bit unnatural but not too deviant and over the top. Comfort is not an issue with GEO lenses and the Grang Grang lenses are no different. I never had a problem with their wear even through a long day. Life span of the lenses are 1 year but with proper use and care you can extend it's life, although I highly recommend disposing lenses around the 6th to 8th month mark or when you feel like it isn't comfortable to use anymore (eyes drying out after a few hours of use, eye irritation, etc). Loving the dolly eyed look with the Grang Grang even if my makeup is not for big eye emphasis. Don't forget to check out LensVillage for other kinds of circle lenses and enter their Selfie Contest on Instagram when you get your purchase!